For really large cities like Hong Kong, Enviro 500s, which capacity up to 137, just appears everywhere, and many of them are fully loaded, overcrowded and sometimes, so overloaded that passengers could literally lean on the front door (like 140-150 passengers in the bus). I don't think that these buses are used in the UK, are they? If they are specific to Hong Kong, they would not be suitable for Pak128.Britian. Wikipedia says First Glasgow has 25. Don't know about Britain, but here in Germany we certainly have buses that can take more than 100 passengers. "SN" is the Edinburgh area, as Lmallet says. Never new Britain had monsters like that! That's a Glasgow bus. It's a service 75 running from Milton to Castlemilk via Glasgow City Centre. 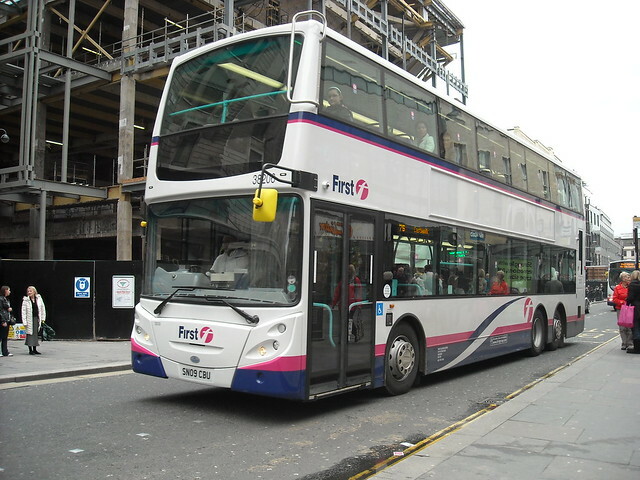 That it a nice bus.Those bus it in moment in uk very rare in use. You wouldn't be allowed to have a bus that overcrowded in the uk. Regarding the Enviro 500 in the UK this has 82 seats (+27 standing) giving 109 total. Over this and you would be breaking the law. Gosh, that's enormous. If it's used in the UK, then it is a candidate for inclusion; we could do with quite a few new 'buses, actually: the trouble is finding the time to add them. 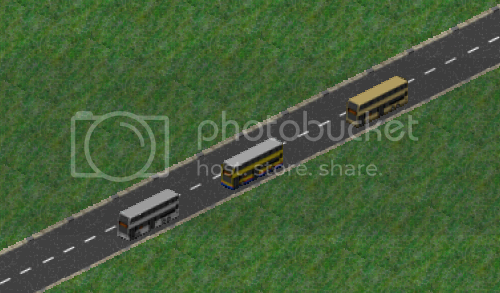 'Buses (and road vehicles generally) have an added complication in that there is currently no automatic rendering alignment for them as there is for other types of vehicle and all types of building, making it take orders of magnitude longer to produce each graphic, as they have to be aligned manually. One day, hopefully I or someone else will get around to setting up a version of the rendering script to align for road vehicles (or alternatively some standard offsets for vehicles aligned normally), and then it will be much easier to produce 'buses, as the graphics for them are relatively simple (except, perhaps, with modern liveries, which have all sorts of weird patterns, as in the 'bus pictured above). A company in Glasgow, UK has a 100 Seater Double Decker in operation. Ive been on the vehicle and it also also a further 12 standing. Interesting. It seems to have been used for tours rather than scheduled services, though. These 11m Leyland Olympians were in service with First from 2000 to 2010. This 12m Leyland Olympian is/was in scheduled services, with proof from the driver himself. Ahh, I see - interesting! As indicated earlier, new 'buses are likely to be slow in coming owing to the absence of automatic alignment for 'bus graphics. Isn't it faster to render the bus, then copy and paste it onto a template? edit: I am in the process of modelling a Super Metrobus, but Sketchup isn't that intuitive in mirroring half-models. No, it's much faster to do the alignments automatically in Blender, as is done with all non-road type vehicles: aligning each of 8 images manually is exceptionally time-consuming. As to modelling, is there a reason that you are using Sketchup rather than Blender, given that you will have to use Blender in the end to render the images? I can't find proper tutorials for modelling buses in Blender. 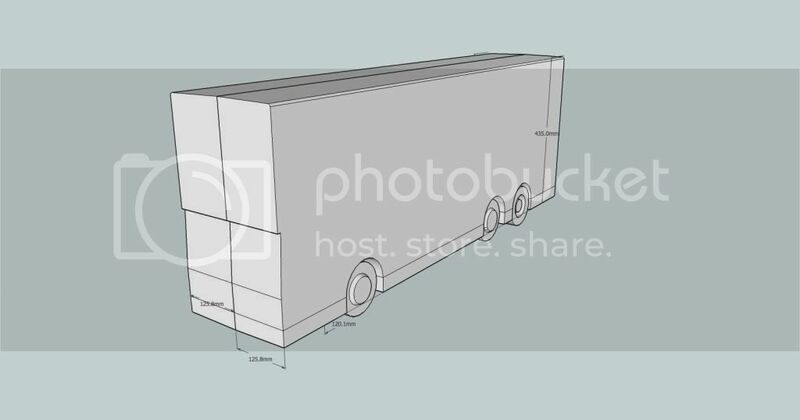 It takes just 10-15 minutes to cut the bus around its edges and paste it onto a template. The best thing to do with Blender graphics is to open one of the existing .blends for the 'buses already in the game, see how that was made, and modify that. The rendering settings are then easily pre-set, and there is no need to import something into Blender later. I have finally finished my first Blender graphics. I am not sure if you would allow it to be in pak128.Britain though. The render presets were done to mimic pak128.Britain. Back to the buses, they are ADL "new generation" E500 prototypes. The latter two of them have since entered service in Hong Kong. The silver one though is still with ADL in the UK. In late 2012, an E500MMC was sent to Edinburgh for evaluation by Lothian. You have previously allowed types that had never entered service in the UK to be included. Citaro K only arrived in the UK in late 2012, but it has long existed in pak128.Britain. If they had prototypical, legal capacities in use in the UK then there's no reason they shouldn't be in the pakset. As I indicated above, the Enviro 500 in the UK this has 82 seats (+27 standing) giving 109 total capacity. Looking good. Could you just check the scales (28m per tile, x1.25 exaggeration width and height), and also the window colour for pak128.Britain is #000000 (pure black).